So You Think You Can Mom? : I've Got a Despicable Giveaway For You! I've Got a Despicable Giveaway For You! 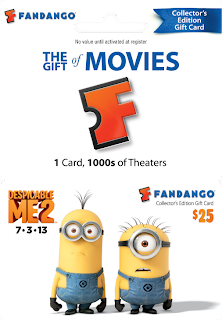 To avoid minion meltdowns, “Despicable Me 2” Fandango gift cards, which are available exclusively at Toys R Us, enable parents to get advance tickets for the highly-anticipated family film opening July 3 -- or any other movie available on Fandango, the nation’s leading online and mobile movie ticketer. The $25 movie gift cards can be found at the Toys R Us one-stop shop for all things “Despicable Me 2,” right alongside talking minion toys, minion mobiles, Gru action figures, banana blasters, and minion missile launchers! As part of the promotion, Toys R Us guests who buy $30 of Despicable Me 2 toys will get 1 free children’s movie ticket (up to $7.50 in value) from June 23-September 30.
www.fandango.com/familyroom -- a new online hub to help parents plan the perfect family movie outing. Disclosure: I was not compensated for this post. I was offered the same Fandango gift card that my winning reader will receive. I follow Fandango on Twitter (@mami2jcn) and on Facebook as Mary Happymommy. My favorite Minion is one-eyed Stuart. Did all requested - haven't seen this movie yet, but want too.... love the giveaway!!! I follow fandango on twitter, FB and my favorite minion is the one who said Papoy when they had to replace the unicorn. Followed. My favorite is Larry or maybe it's Stuart. I follow Fandango on Facebook as June Lisle and on Twitter @Battle_Cry87. 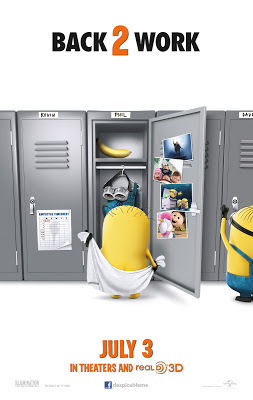 I think the name of my favorite minion is Dave. I followed Fandango on Twitter, and liked Fandango on Facebook. Thank you for the opportunity! Follow Fandango on Twitter "wildorchid985"
Like Fandango on Facebook " wild orchid"
i like the phil minion! I love the minions! My favorite minion is Carl. I follow Fandango on Twitter as @AnnaZed. I like Fandango on Facebook where I am Margot Core. I follow Fandango on Facebook and Twitter. Favorite Minion is Kevin. Thanks for the chance to win!